04:45 Hello and welcome back to AUTOSPORT Live for continuing coverage of the inaugural Korean Grand Prix from Yeongam. The most eagerly-anticipated weekend of the season is finally underway and, with just three rounds remaining in the 2010 campaign, time is running out for the rest to catch Mark Webber and Red Bull Racing in the title race. Both the Korean organisers and the drivers have done a remarkable job so far to ensure a smooth running of the first practice session, but now things get more serious. The racing line is slowly starting to rubber in and the 24 combatants will begin to push harder in order to gain good data for both qualifying and Sunday's 55-lap race. A reasonable crowd is already in attendance at the circuit, and with figures of 60,000 and 100,000 expected for Saturday and Sunday, the atmosphere is sure to intensify as Korea embraces grand prix racing for the first time. 04:47 Following weeks of speculation and anticipation, the drivers headed out at the call of the green light to begin the Korean Grand Prix weekend. Everyone knew it was going to be a difficult opening practice phase, with extreme levels of dust all over the circuit, so the drivers took things cautiously and sensibly in the early stages. Michael Schumacher was one of the first to post a meaningful lap time as he began to learn his way around, but soon the Red Bull and McLaren drivers got down to brass tacks and moved to the top of the standings. Williams drivers Nico Hulkenberg and Rubens Barrichello also provide interest for a time, half-way through the session, as they took a turn at the head of the list. But it was a strong run towards the end by Lewis Hamilton that saw the Briton top the timesheet with a lap of 1m40.887s, ahead of a charging Robert Kubica. Nico Rosberg was third for Mercedes, with Sebastian Vettel fourth, Jenson Button fifth and Michael Schumacher rounding out the top six. 04:49 Weather conditions remain fine and dry at Yeongam with plenty of sunshine on offer for this second session. We may see a little more cloud drift in from the south-west as the afternoon wears on, but the sunny spells will continue as temperatures rise to 22 degrees Celsius. Sunday's forecast is beginning to change and there is an increasing risk of rain for the grand prix. We will take a much closer look at this and how the rest of the weekend is likely to develop on the Korean Grand Prix Weather page later today. 04:50 Keep up to speed with our minute-by-minute commentary on the move with the new AUTOSPORT app. 04:51 Motor racing fans love to debate the action on track and the live forum is your opportunity to share your experiences of the Formula 1 weekend with everyone. 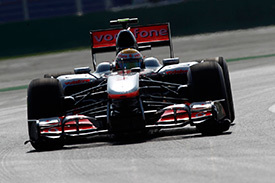 • Will Lewis Hamilton and McLaren top the times in today's second session as well? • Bruno Senna was the only driver to spin off the circuit this morning with a wonky wheel on his HRT. Will we see any similar incidents this afternoon? 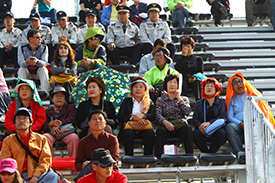 • What are your impressions of the Yeongam circuit so far? 04:53 As the track evolved quickly during first practice - particularly as the pack circulated towards the end of the session - one pattern began to emerge that may shape the outcome of the weekend. Racking up the marks for 'longest' is Yeongam's epic first sector, with a trio of straights including the 0.74 mile blast from Turns 2 to 3. It's the ideal place for an F-duct to reduce the drag from wing angle than can be put to good use around the rest of the lap. McLaren is testing a tweaked version of its revised F-duct rear wing introducted on Friday in Suzuka, with the hope of finally racing it on Sunday. Hamilton's MP4-25 ended the first session 1.4 seconds quicker through the first part of the lap than his championship rivals in the Red Bull team, while Kubica was also quick with the Renault's F-duct that has worked brilliantly since its introduction at Spa. 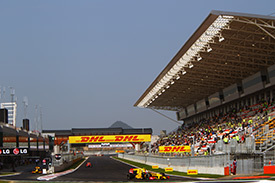 While Red Bull look strong through the twisting final two portions of the lap, which are ideally suited to the RB6's potent downforce, the Milton Keynes-based squad must be concerned at this stage that its lack of pace through the first sector could put it behind the leading F-duct cars this weekend. 04:55 There are five minutes to go until the drivers get another chance to run on the still-dusty circuit. 04:56 The track temperature is up to 35 Celsius in the afternoon sunshine. 04:57 Lewis Hamilton is requesting a minor adjustment down by his shoulder in the left-hand side of the McLaren's cockpit. 04:58 Felipe Massa walks into the Ferrari garage and immediately climbs aboard the F10 ready for more action this afternoon. 04:59 Mark Webber slots himself into the cockpit of the Red Bull RB6 as he looks to continue the strong pace from this morning. 0 min: Jaime Alguersuari is the first driver to venture out onto the track this afternoon. 1 min: The Spaniard will be using a set of the hard tyres for this first run of laps as he continues into the twisty second section of the circuit. 1 min: Sebastian Vettel, Sebastien Buemi and Nico Hulkenberg have also joined the racetrack. 1 min: Di Grassi is quickly on track to learn the circuit having sat out the morning session for Virgin. 2 min: Massa, Heidfeld, Hamilton and Button are also out to make a quick start to second practice. 2 min: Replays show that Alguersuari briefly ran off the circuit at Turn 14. He continued and is now on the first timed lap of the afternoon session. 2 min: Unusually, there has been no support action on track since the end of first practice. 3 min: The sole support event, for Hyundai touring cars, begins with a practice session tomorrow. 4 min: Alguersuari has another moment at Turn 10 on his timed lap and encounters horrendous oversteer at the exit of Turn 15 on his way to 1m49.539s. 5 min: Liuzzi, Barrichello and Sutil are on the racetrack, as Buemi goes quickest with 1m48.334s. 5 min: Nico Hulkenberg takes over at the top with a lap of 1m46.436s. 6 min: Alguersuari retakes the top position with a lap of 1m45.156s in the Toro Rosso as the quick laps continue. 6 min: Hamilton takes the benchmark time with his first flying lap of 1m45.093s. 6 min: Sebastien Buemi moves ahead of Lewis Hamilton to take over at the top of the order with a lap of 1m44.536s. 7 min: Liuzzi moves into second position behind Buemi with a time of 1m44.561s. 7 min: Hamilton is comfortably quickest through the first sector as he presses on with his next lap. 7 min: Alguersuari tops the order for the third time in this session already with a lap of 1m44.404s. 8 min: Hamilton tops the times again as he lowers the benchmark to a 1m42.064s with a trio of fastest sectors. 8 min: Hulkenberg moves into second place with a lap of 1m42.172s as the drivers continue with a short run of laps. 9 min: Liuzzi is up to third in the Force India, but he is quickly demoted by team-mate Sutil who is now third, with a lap of 1m42.609s. 10 min: Alonso takes away the top spot with a 1m41.928s effort in his Ferrari. 10 min: Hulkenberg returns to the pits after a short run of five laps. The young German is currently third in the classification behind Alonso and Hamilton. 10 min: Tonio Liuzzi moves to the top of the tree with a lap of 1m41.832s. 10 min: Glock is one of the first to explore the run-off at Turn 11 but there is plenty of space down there to recover back to the circuit. 11 min: Petrov was briefly setting the pace but Alonso is back on top with his latest 1m41.153s effort. 12 min: Kubica is now second quickest, with Button third. 12 min: Interestingly, there is no move from either Red Bull driver as yet. Webber and Vettel have completed a short installation run. 12 min: Rubens Barrichello goes fourth in the Williams with a lap of 1m41.757s. 13 min: Hamilton joins the long list of drivers to run wide after a mistake under braking at the first corner. 13 min: Nico Rosberg is set to improve on a lowly 17th position. He crosses the line in 1m42.258s and moves up to 12th. 14 min: Alonso and Hamilton are now trading fastest sector times as Ferrari shows its hand. 14 min: Barrichello improves once again with a lap of 1m41.201s and is now second to Alonso in the classification. 15 min: Alonso clocks the fastest time of the day with a 1m40.167s. 15 min: Michael Schumacher is up to third position in the Mercedes after posting a lap of 1m41.480s. 15 min: The Mercedes drivers are on the move as Rosberg demonstrates by going into second place with a lap of 1m40.581s. 16 min: Barrichello returns to the pits after a short run of seven laps in the Williams. He has slipped to third position behind Alonso and Rosberg. 16 min: Massa is now fourth quickest for Ferrari, with Kobayashi up to fifth in the Sauber. 17 min: Bruno Senna is sidelined in the pits with a mechanical problem. The HRT driver has yet to leave the pits and suffered a failure this morning during first practice. 17 min: Mark Webber is out on the circuit and the Australian moves up to ninth position with a lap of 1m41.546s. 18 min: 1m40.148s is now the time to beat. 18 min: Webber is continuing to improve on his next lap, and moves up to third position with a lap of 1m40.444s. 19 min: Lewis Hamilton leads the way after 19 minutes of the second practice session with Alonso in second, Webber third, Rosberg fourth and Barrichello in fifth. 20 min: Webber makes a further improvement in lap time as he breaks the beam in 1m40.254s. He remains in third position behind Hamilton and Alonso. 21 min: Sebastian Vettel exited the pits and came the back in immediately to complete a pitlane time loss test. He is back out and now starting a timed lap. 23 min: The right front wheel of Mark Webber's car is noticeably clear of the ground as the championship leader makes his way through the tight right-handed corners on the circuit. 24 min: The front right on Vettel's sister car was also showing signs of lifting up as the load transfers to the left rear of the RB6. 24 min: Rubens Barrichello is back out on the circuit and aiming to improve on a current fifth position. 25 min: Vettel came back into the pits at the end of his fourth lap. He has yet to set a time. 25 min: A tight battle is shaping up so far between the championship contenders, with Hamilton six tenths quicker through the F-duct dominated first sector than Webber's Red Bull but the laptime shaking out with just over a tenth between them so far. 26 min: Barrichello completes that lap in the 1m45.966s and it is likely that the fuel has already been added to the Williams in preparation for Sunday's race. 26 min: The session has been stopped. 27 min: Sakon Yamamoto has spun exiting Turn 16 and is stranded on the circuit with no drive. 27 min: The Japanese driver was not able to keep the engine running during the spin. 28 min: The HRT is stuck in the middle of the circuit at the entrance to the tight Turn 17 right-hander leading onto the pit straight. 28 min: With concrete walls either side and no run-off area at that section there was no choice but to halt the session. 29 min: The session clock will continue to count down during the recovery of the HRT. 29 min: Replays show that Yamamoto bottomed out heavily in a compression at the apex of Turn 16 and the Japanese driver was pitched into a spin immediately. 30 min: The session will restart at 14:32 local time. 31 min: Yamamoto's HRT is being removed by the marshals as the team continues working on problems with Senna's sister car. 31 min: The session has restarted. 32 min: Jaime Alguersuari leads a queue of cars back onto the circuit. 32 min: He is joined by Toro Rosso team-mate Buemi, Hulkenberg and Schumacher. 33 min: Hamilton and Button are back underway on hard tyres. 33 min: Barrichello, Rosberg and Sutil are also on the circuit as the track begins to fill up quickly. 33 min: Massa is also out, now with the full F-duct rear wing on his Ferrari. 37 min: Nico Hulkenberg is down in 15th, but set to improve at the completion of his current lap. 38 min: Timo Glock is again leading the new team stakes down in 18th but finds himself in Button's way through the walled final section. 38 min: Hulkenberg moves up for positions to 11th as his team-mate Barrichello goes fifth, with a lap of 1m41.018s. 38 min: Michael Schumacher has improved and is in seventh position in the Mercedes with a best lap so far of 1m41.255s. 39 min: Button is forced to back off considerably to find a clear patch after continued traffic, this time from di Grassi's Virgin. 39 min: Schumacher has another go and this time he tops the order with a lap of 1m40.009s. 40 min: That lap from the seven-time champion demotes Hamilton into second, Alonso third, Webber fourth and Rosberg to fifth. 40 min: Button sets the fastest first sector but only goes fifth fastest after even more traffic and a couple of moments closing the lap. 41 min: Barrichello posts two personal-best sectors and is looking to improve on ninth position. 41 min: Barrichello crosses the line in 1m40.470s and moves up to sixth, as we see Alguersuari of the road briefly. 42 min: Button clocks a 1m40.006s to grab the top spot by three thousandths. 42 min: Sebastian Vettel is about to entertain us with a soft tyre run in the Red Bull RB6. The German has yet to set a time. 43 min: Hamilton is just over a tenth behind Button's benchmark in third quickest with Alonso now fourth in the Ferrari. 43 min: Button leads the standings as we approach the halfway stage in the session with Schumacher second, Hamilton third and Alonso in fourth. 44 min: Vettel is now on his first timed lap with those soft tyres ... and he runs off the circuit in the twisty section of the course. 45 min: Vettel was stuck behind the Lotus of Jarno Trulli, but was able to rejoin. He crosses the line and will go again. 46 min: Vettel was less than pleased with Trulli because he occupied the racing line, but the German now has some clear track to work with. 46 min: Button comes back into the McLaren pit with a lot of smoke from what looked to be his rear brakes. His car is cooled with some extinguishers. 47 min: Vettel is running very quickly and is set to take the top time at the completion of the lap ... he does with a time of 1m39.204s. 48 min: Button has stepped out of his McLaren while the team investigate the source of that overheating on his car. 48 min: Vettel has continued round for a second hot lap on these tyres. He crosses the line just 0.044 seconds down on his current benchmark. 49 min: Vettel has now backed off and may be about to return to the pits at the completion of this lap. 50 min: The work continues on Bruno Senna's car in the HRT garage. The Brazilian has not made it out onto the track yet in this session. 51 min: Sakon Yamamoto's HRT is now back in the pits and being pushed towards the garage by four mechanics. 51 min: Trulli is now on his team-mate's pace in the 1m46s bracket but the Lotus pair remain slower than their Virgin rivals at the moment. 52 min: Vettel did return to the pits and completed two hot laps on the soft tyres to set the pace so far in second practice. 53 min: Button is second but almost one second behind the German with Schumacher third, Alonso fourth and Hamilton in fifth. 53 min: Trulli has now split the Virgin pair, with Glock having another off-track moment while testing on the softer tyres. 53 min: Michael Schumacher comes back out onto the circuit for another run of laps. Webber, Barrichello and Hulkenberg are also on track. 54 min: Hulkenberg improves to 12th position in the Williams with a lap of 1m40.891s. 54 min: Massa is heading out for a run with soft tyres on his Ferrari. 54 min: Webber is continuing to run with the hard tyres and he crosses the line in 1m39.251s to go second behind his team-mate Vettel. 55 min: Petrov is also testing the softer tyres on his Renault. 55 min: Michael Schumacher has chosen to run the soft tyres this time round. The German is currently fourth, but on a hot lap. 56 min: Schumacher posts the fastest first sector time with 53.3 seconds as he bids to move up the order. 56 min: Alonso and Hamilton are also warming up to a soft tyre run. 56 min: Sebastien Buemi has spun at Turn 1 but he was able to rejoin. 57 min: Schumacher posted 1m39.921s and that moved him up one position to third. 57 min: Petrov is now the fastest man through the first sector but is furious with Liuzzi after he held up the Renault in the final corners. 57 min: Meanwhile, Hamilton tops the times on his soft tyres with a 1m38.922s. 58 min: Mark Webber is on a quick lap and just manages to avoid Schumacher's Mercedes on his way to 1m38.839s and the fastest time of the session so far. 59 min: Hamilton is now second with Vettel third, as Rosberg moves up to fourth position with a lap of 1m39.268s. 59 min: Massa springs up to third quickest with a good lap after a few laps on his soft tyres. 59 min: Rubens Barrichello posts an improvement and the Brazilian moves into seventh position with a lap of 1m39.812s. 60 min: Schumacher jumps ahead of Barrichello and he moves into seventh place with a lap of 1m39.598s on soft tyres. 60 min: Hamilton now has the first sector down to 52.7 seconds and he goes back to the top by over half a second. 1m38.279s is the new time to beat. 61 min: Massa continues his move up the order, going second to Hamilton with a 1m38.820s. 61 min: Webber and Rosberg are back into the pits following an entertaining flurry of quick laps. 62 min: Hamilton is back at the top of the order with Massa second, Webber third, Alonso fourth, Vettel fifth and Petrov in sixth. 62 min: Renault continues to look strong in the battle of the F-ducts as Petrov takes the quickest time through the long first sector. 63 min: Alonso beats his team-mate to second with a lap of 1m38.537s on his soft tyres. 64 min: Many of the leading drivers are now back into the pits following those improvements. 64 min: Button's McLaren remains under repair in the garage after that earlier exhaust overheating in the pitlane. 64 min: While they all come in, Sebastian Vettel comes out for another run. His team-mate Webber joins him after a brief stop in the pits. 65 min: Kubica takes third quickest as the Pole tests soft tyres. He's also fastest through the first sector on his next lap. 66 min: Kubica survives a wild moment through the final corners, narrowly avoiding the extremely close walls. 67 min: Both Red Bull drivers are now in the first sector of a timed lap. Webber is on soft tyres for this run. 67 min: Alonso edges his Ferrari back to the top of the times with a 1m38.132s. 68 min: Mark Webber spins exiting Turn 12 and slides backwards onto the asphalt run-off area. He keeps the engine in and is able to rejoin. 69 min: We can see that the astroturf beyond the exit kerb at Turn 12 has been ripped up. 70 min: Vettel is also using soft tyres for this run of laps. He is currently in sixth position. 70 min: Bruno Senna remains sidelined in the pits and has not been able to join the track so far in this session following mechanical problems. 71 min: Mark Webber is on the move once again and he posts a personal best sector time of 52.7 seconds in the first sector. 71 min: Webber is able to carry the speed through all the way to the end of the lap and he goes fastest with a time of 1m37.942s. 72 min: The soft tyres runs are certainly proving fruitful for the Red Bull drivers this afternoon. 74 min: Hulkenberg reports on the team radio that his tyres falling to pieces. He is advised to stay out in order to clean them up. 74 min: Having set the fastest time, Mark Webber is back in the pits. Alonso is second with Hamilton third, Kubica fourth, Massa fifth and Vettel in sixth. 75 min: Button is getting back into his McLaren as the team wrap up repairs to the rear of the MP4-25. 77 min: The track is becoming busy, with 17 drivers on the circuit, as we approach the final portion of the first day's of running at Yeongam. 78 min: Many drivers are now heading out for a long run to the flag on the soft tyres to look at the potentially high tyre degradation on a heavy fuel load. 78 min: Nico Rosberg has been off the road at Turn 1. The German briefly ran onto the asphalt run-off area but was able to continue. 80 min: The racing line is beginning to rubber up quite nicely and the darker shading can be seen visibly at several sections of the circuit. 80 min: Button is now heading out for his first experience of soft tyres after that earlier overheating problem in the pits. 82 min: This afternoon's pacesetter Mark Webber heads out onto the circuit for a final run of laps with just over eight minutes to go. 83 min: Button finds traffic again on his first flying lap on soft tyres and backs off to find some more space. Webber's Red Bull is now close behind. 84 min: Massa has been off track again, this time at Turn 9. He resumes in a huge cloud of dust. 85 min: The work appears to be complete at HRT and the team is going to get Senna out with under five minutes to go in the session. 85 min: Button remains down in 15th as he again aborts an effort on the soft tyres. 86 min: It's third time lucky for Button as he clocks a 1m38.726s, moving up to fifth. 87 min: Bruno Senna finally exits the pits and the Brazilian joins the racetrack, but he will only get a couple of laps before the chequered flag comes out. 88 min: Tonio Liuzzi has stopped at the side of the road after running wide at Turn 11 slightly earlier in the lap. 89 min: Senna is out on soft tyres for what will be his one and only timed lap this afternoon. 90 min: The flag is out on the first day of practice in Korea. 06:30 Massa labels his Ferrari as "undrivable" through the final sector. 06:31 Senna crosses the line in the 1m46.649s - more than eight seconds off the pace. 06:33 Bruno Senna continued to lap as quick as possible on his way back to the pits, but ran off the road briefly as he explored the limits. 06:33 Senna was able to rejoin the track without any visible signs of damage and has since returned to the pits. 06:33 Mark Webber tops the second practice session for Red Bull at the Korean International Circuit, with a quickest lap of 1m37.942s. 06:34 Fernando Alonso was second for Ferrari - 0.190 seconds down on Webber's quickest time, with Hamilton third and Kubica fourth. 06:35 Button was fifth in the second McLaren ahead of Massa sixth, Vettel seventh, Petrov eighth, Rosberg ninth and Kobayashi rounding out the top 10. 06:39 The scenery and the circuit might be different is but the main theme of 2010 continues after an interesting first day of practice at Yeongam. 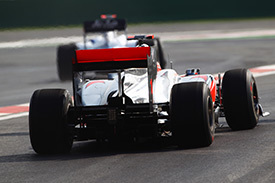 McLaren, Red Bull, Ferrari and Renault are the equipment to have and they occupied the top eight positions in the classification. The track was beginning to rubber in reasonably well as the session wore on and, with little in the way of support racing activity this weekend, the drivers will be quite pleased that the Formula 1 rubber on the racing line will not be disturbed over the course of the weekend. The battle will continue tomorrow, with everyone will be out to set the fastest time in the final practice and then qualifying. Join us tomorrow for all the Saturday action beginning at 01:45 GMT.